Two-way texting is fully integrated inside Manager SE. You can send templated (repeat messages) or on-the-fly text messages to customers from the appointment editor or the WIP, Order or Revision screens. It’s easy to get started: Select the Text Messaging Setup button in Configurations, then click on Request Texting Phone # and the number will populate and be ready for configuration. In our next blog post, we’ll show how simple it is to add this to your Manager SE 7.5 system. Read more about MessageCenter: Text Messaging is the Latest Addition to Manager SE! Users can now manage the oil change sticker printing process inside Manager SE. 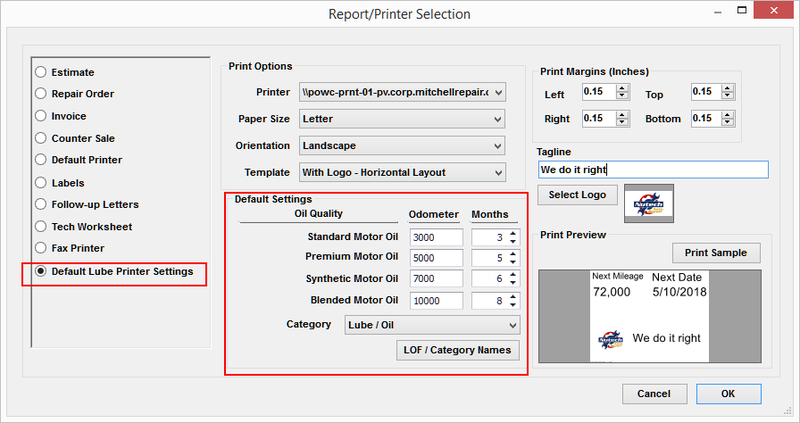 It’s customizable to each shop, managing the entire process from printing the oil change sticker through creating a recommendation and setting the customer’s next appointment. Select Oil LOF Level/Quality to customize to your facility. Inventory – Detailed Inventory, Tire Sale/Qty/Profit, Tire Physical Count, Sales Summary Tires by Date Range, etc. The new Category Profit – Custom List report allows users to select their own categories to create a custom summary! Users will clearly benefit from the additions and enhancements included in the Manager SE 7.5 release. Best of all, we’re not done yet… stay tuned! Prev:Text Messaging is the Latest Addition to Manager SE! Next:Meet ProSpect, our new digital vehicle inspection app!